All of the diving on Dominica takes place within one of three Marine Reserves: The Cabrits National Park Marine Section in the north, the Salisbury Marine Reserve in Dominica's central west, and the Soufriere Scotts Head Marine Reserve, the oldest Reserve on the island, located in the south west of the island. 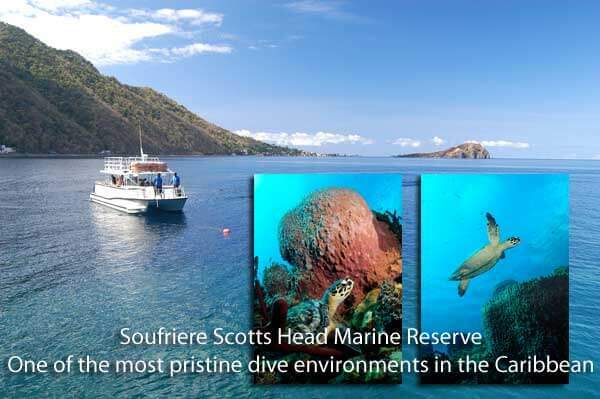 As it is just a short boat trip from Dive Dominica, most of our diving takes place in and around the Soufriere Scotts Head Marine Reserve. All dive sites have permanent moorings. All visitors to our island are required to pay a small marine park users fee which helps fund the maintenance and upkeep of moorings and the parks. We uphold a strict "look but don't touch policy" to help keep our marine habitat pristine for many generations to come. Not surprisingly, the topography of our dive sites mirrors that of our diverse landscape above. High mountain peaks above create dramatic drop offs, walls and canyons below. Mountain passages become swim throughs and caverns. There are massive boulder fields and volcanic craters underwater just as there is above water. Pinnacles rise up everywhere. We even have active underwater fumaroles. 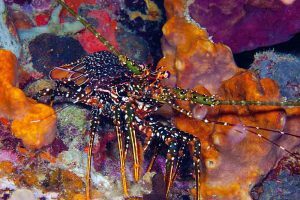 All of these conditions combine to create the ideal environment for some of the best diving in the Caribbean. 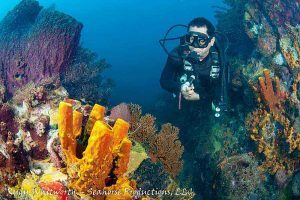 Our professional dive staff know the environment and its inhabitants intimately and enjoy nothing more than sharing the beauty of this underwater world with you while at all times ensuring your safety. Champagne Reef: Champagne Reef gets its name from the bubbles produced from the underwater hot springs. The dive itself usually consists of a circuit around Champagne reef, followed by a safety stop exploring the hot springs and bubbles. This is a dive for all levels; calm water and Currents here are usually light. 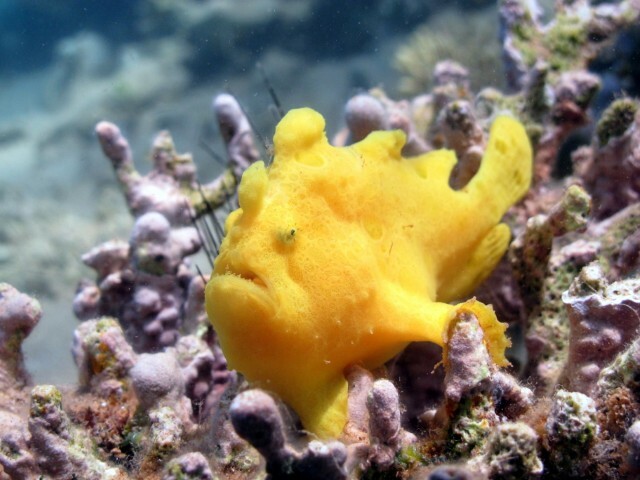 It is not unusual to find seahorses and frogfish here, and flying gurnards are common over the shallow sandy areas. Squid can often be seen in-shore not far from the bubbles. 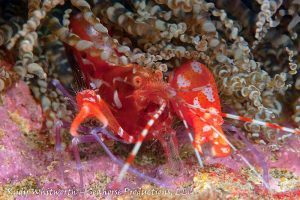 The site makes an excellent night dive as well when the reef explodes with life: huge crabs and lobsters are common sightings. 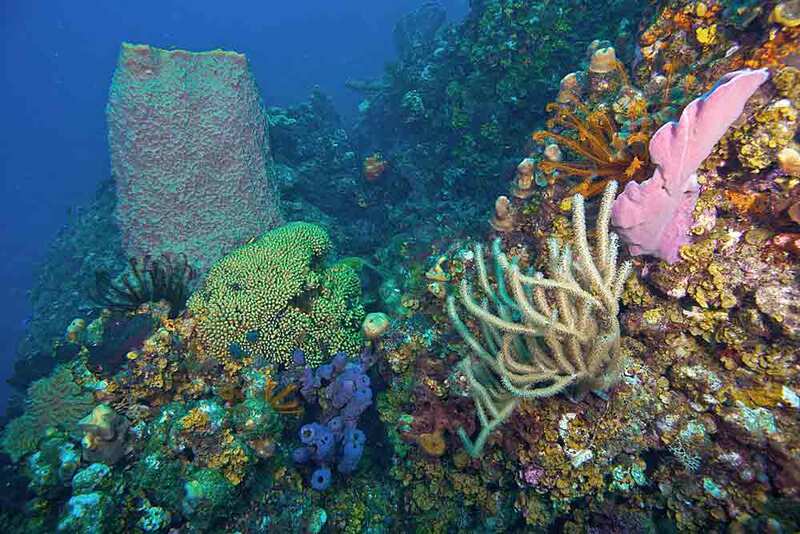 Coral Gardens North (Dangleben's North): Located just south of Pt Guignard, this site is part of a large reef system made up of Dangleben's Pinnacles, Coral Gardens South and even L'Abym North. This site can have some strong currents but also can be extremely easy. Starting in about 40 ft of water, the reef drops gradually to the west and can be done on its own or as a drift to Danglebens. Large sponges, brilliant color, and beds of finger coral are the dominating elements of this reef system. Turtles are frequently sighted, and when the currents are just right, large schools of horse-eyed jacks, sennet and various other fish congregate here. 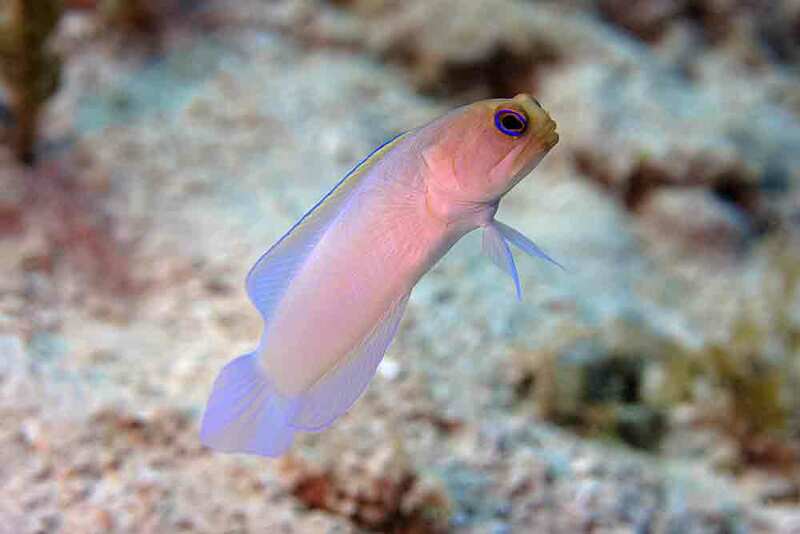 The end of the dive can be spent in about 40 ft watching the yellow headed jawfish in the sand. Crater's Edge: Continuing northwest from Scott's Head Pinnacle there is a volcanic ridge that leads out to Crater's Edge. This site is guaranteed to please. 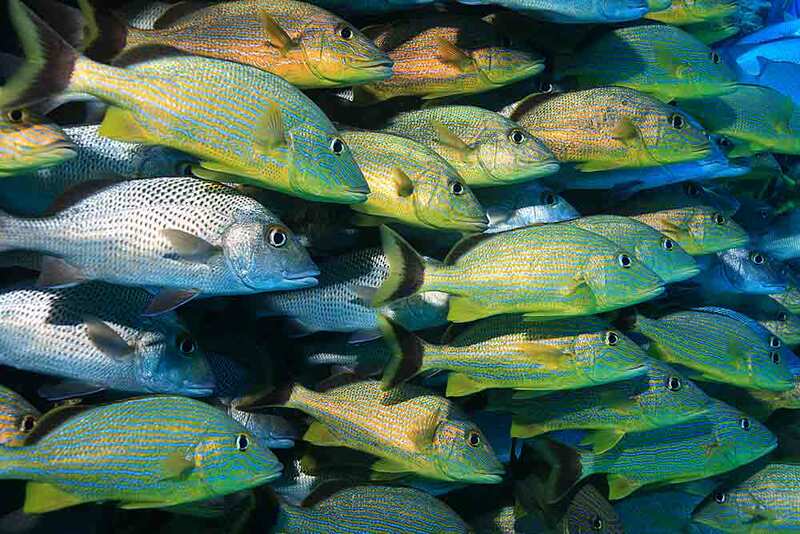 There are masses of black jack, bar jacks, rainbow runners, tuna, yellowtail snapper and cero, all pursuing schools of baitfish who dart back and forth in a futile attempt to escape their hunters. If you can peel your eyes from this frantic activity and look toward the pinnacle you will see waterfalls of Creole wrasse and brown and blue chromis. 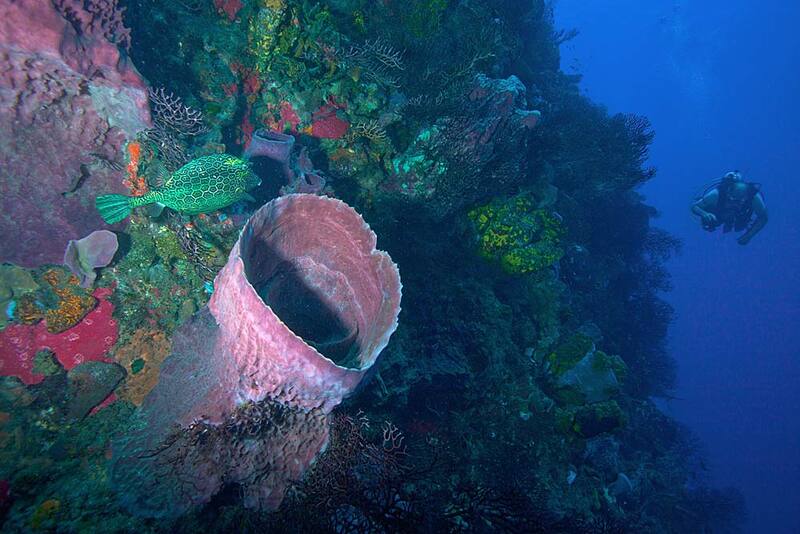 Behind all this activity is a spectacular wall covered in colorful sponges and giant barrel sponges. It is not uncommon to be followed by one or two giant barracuda escorting you from the area. The Crater's Edge Pinnacle can easily be circumnavigated during a single dive, or one could follow the volcanic ridge towards Scott's Head Pinnacle. Scott's Head Pinnacle: Scotts Head Pinnacle is justifiably one of the island's most famous dive sites. Divers regularly request repeat visits to this site. The dive begins on Swiss Cheese, a large rock formation home to the well-known Soldierfish Cave. Not actually a cave, this swim-through is usually packed with soldier fish and grunts that form a curtain in front of you, briefly parting to swallow you into the school as you pass through. Crossing a flat area of coral-encrusted rock formations leads to the Pinnacle itself. At a depth of only 35 ft, a picturesque swim-through bisects the pinnacle, bringing you to the "other side" -- a steep wall on the inside of the volcanic crater that falls off to more than 120 ft. The swim-through is home to blackbar soldierfish, grunts and lobster. The wall is dominated by deepwater sea fans and other colorful gorgonians. Scott’s Head Drop Off (Scott's Head Point): This wall is spectacular at any depth, from 40 to 100 ft. It is an incredibly colorful dive with pink and azure vase sponges, orange icing sponges, yellow tube sponges, and green rope sponges. 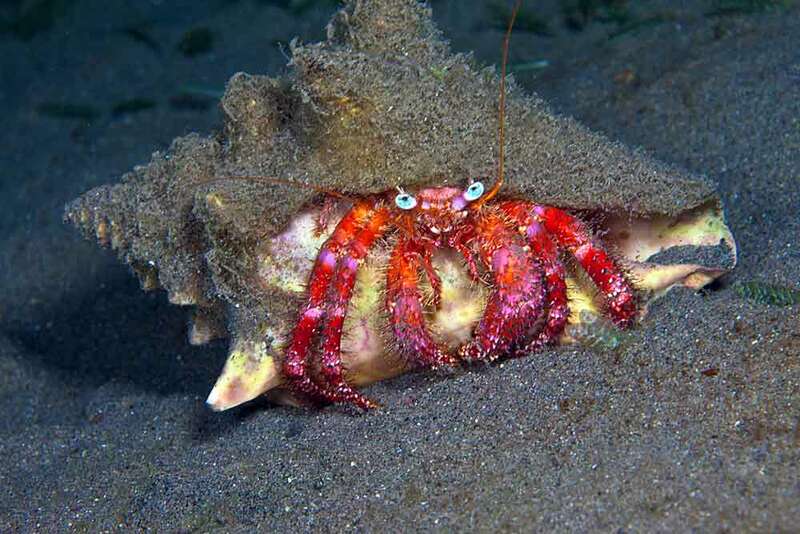 The many small nooks and crannies hide lobster, crabs, and many different kinds of cleaner shrimp. The end of this dive consists of a 50 ft safety stop so vibrant it is worth the trip by itself. L’Abym (La Sourcier): In the southern corner, one can float 30 ft off the wall and see the surface cliff enter the sea then drop into the deep on both sides of you, a truly impressive sight. 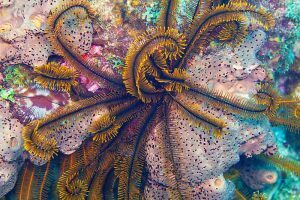 In addition to the beautiful topography, one can usually find seahorses, scorpion fish and turtles or solitary barracuda. The most unusual thing about this site, despite the massive wall, is that it is suitable for all levels. The start is on a sandy/rock shelf at 25 ft and there is rarely any current. The wall can be dived from 40 ft or deeper and all depths are equally impressive. A "must" dive for most visitors; it truly sums up the dramatic topography of the island. Pointe Guignard: This gradually sloping reef is best known for its swim-through when returning to the boat. There is a cave at about 50 ft that has some interesting life, but it is narrow and can very quickly silt up, so it is not recommended for large groups or anyone without perfect buoyancy. This site is also a good spot for seahorses and frog fish and is frequently visited by turtles in-season. Pointe Ronde and the Craters: Pointe Ronde and the Craters have very gently sloping reefs in excellent health showing vibrant colors and abundant marine life. The latter site starts off around 70 ft and when you reach the craters, the reef drops abruptly to 92 and 120 ft. The bottom of these impressive craters is sand marked by curious small holes from which occasional streams of bubbles escape. Here, the sand is warm to the touch. If you dig beneath the surface, beware – it may burn! The Suburbs: The Suburbs and The Village are richly covered rocky drop-offs that are visited by schools of black durgons, huge barracuda, frequent turtles, and often some big stingrays. One never knows what might pass in this much wilder area, but on the quiet days when nothing exciting happens, take time to enjoy the magnificent coral life. Hundreds of crinoids and sponges paint a brilliantly colorful underwater landscape. Huge barrel sponges are prolific, and walls of incredibly dense deep-water sea fans frequently conceal shy seahorses. The Village: Another advanced southern Atlantic site, the mooring sits in 30 ft on top of the wall. From the depths three rock pinnacles rise, each slightly shallower than the other, giving a good multi-level dive. As with all sites in the Atlantic, sponges grow large and horizontal, the corals are predominantly soft fans, and schools of big fish are common. Dive Site descriptions courtesy of Discover Dominica Authority.